Lauren is originally from Rochester, NY. She has recently moved to the Boston area from Indianapolis, Indiana. She graduated from the University at Buffalo with a Doctorate of Physical Therapy in 2008 after completing her B.S. in Exercise Science. Her clinical experience includes outpatient orthopedics, sports medicine, post-operative orthopedic care, work conditioning, and acute/inpatient hospital care. 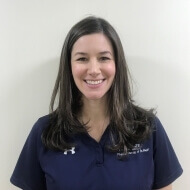 She has experience treating a broad spectrum of patients from young athletes getting back to competitive play to geriatric patients whose goals are to restore their daily function. Lauren played Division I soccer for the University at Buffalo and continues to participate in recreational athletics to maintain fitness level. She enjoys working with an active population to restore function, return to prior level of activity, and achieve personal goals.